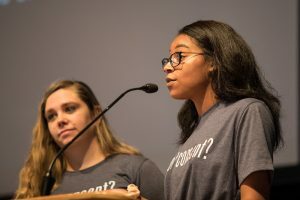 The t-shirts made for Take Back the Night (TBTN) events at Eastern Mennonite University Oct. 31-Nov. 2 may have been seen as a humorous twist on a milk ad campaign, but they also made an important statement, said co-organizer Ana Hunter-Nickels. 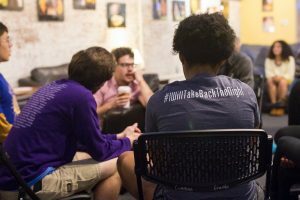 With “got consent?” on the front, and “#IWillTakeBackTheNight” on the back, the shirts were a “huge hit” – and reflected the events’ focus on consent and awareness. Organizers Ana Hunter-Nickels (left) and Jasmine Wilson give opening remarks during the Take Back the Night chapel service on Oct. 31. TBTN events have been held at EMU for about two decades. The chapel service concluded with a time for attendees to write #IWill statements related to preventing sexualized violence. Events opened with a chapel service that began with the lighting of a candle and time of centering. 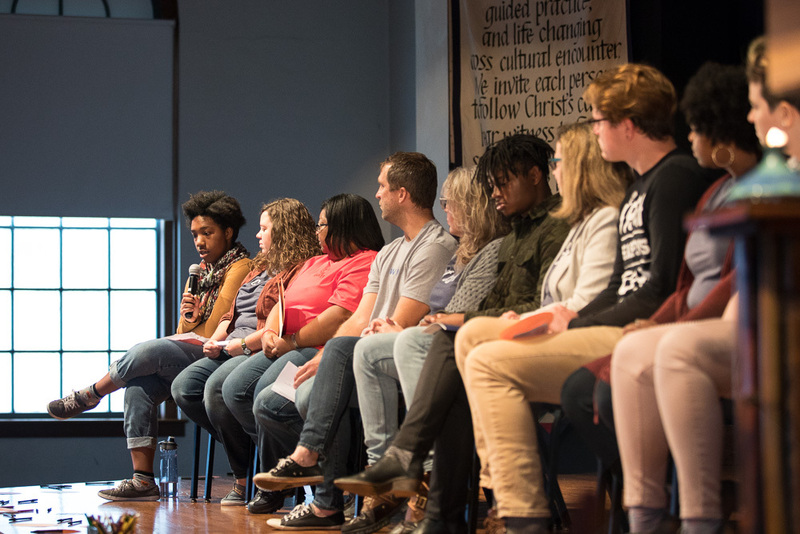 After a short video about self-accountability, a panel of 11 students, faculty and staff offered reflections about why sexualized violence matters to them. The program concluded with a time for attendees to write #IWill statements related to preventing sexualized violence. The campus community was also invited to an evening film showing and discussion. The campus community was also invited to an evening film showing and discussion in Common Grounds. 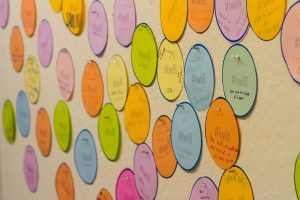 Three luncheons provided space for people to reflect on their own experiences and share stories, and a closing event for writing notes of encouragement to survivors, to be delivered to a local shelter. TBTN events this spring will focus on further education and prevention, Wilson said.